Topic August/September 2017. Throughout its history the Legion of Frontiersmen has attracted countless men, and more than a few women, whose travels had taken them all over the world. Many was the story they could, and sometimes did, tell of their adventures in lands where you could travel great distances without encountering another human being. Some did write about their experiences. Occasionally long-forgotten books about their adventures turn up on the dusty shelves of second-hand bookshops. The stories of some of them we will never know as they did not consider there was any need to commit them to writing or to print. Over the years the writer of this topic page has been fortunate enough to meet several old Frontiersmen, now no longer with us, and hear some of their stories. There has to be one major regret regarding a Frontiersman who could have told so many splendid tales. Back in 1978 I received a couple of letters from 90-year-old Percy Escott North who lived at the charmingly named Casa Lareda in Lambley, Nottinghamshire. There he could hear the sound of horses’ hooves through the village, which took the old man’s mind back to his young days in the “Wild West”. He had joined the Legion in 1911 and was given the Legion number of 4576, knew Roger Pocock and many of the original members, had met Driscoll and F.C. Selous in East Africa, and even knew Buffalo Bill Cody. He had been told of my researches into the Legion of Frontiersmen and Roger Pocock by Edgar Vigay, who was the commanding officer of U.K. Command of Canadian Division of the Legion. Vigay had re-enlisted the old man into Canadian Division. Would I care to travel up to Nottinghamshire and meet him? I would very much wish to, but with a young family and large mortgage to support I could afford neither the time nor the money. That was an opportunity I always greatly regretted being unable to take. Bill brought his great Wild West Show to London in 1902, and King Edward visited it. The King begged permission to take a ride on the famous old Deadwood Stage Coach, and to bring some of the Royal guests who were at that time staying at Buckingham Palace. Cody expressed himself delighted and the matter was arranged. In due course the King and his guests arrived and, having packed his friends in the coach, King Edward climbed up on the box beside Cody, who was to drive. Cody was surprised to see the King wink portentuously to him, and to hear him whisper, “Now, drive like hell, Cody!” Never did coach travel so wildly as did the Deadwood stage around the Olympia arena. Cody put himself into the driving as never before, and the six cayuses tore around the ground at mad speed. As far as can be ascertained, this story has not appeared elsewhere. We know that in his Show Buffalo Bill re-enacted as his own adventures those that were experienced by other men, so probably would not be averse to telling “tall stories”. King Edward VII did visit Buffalo Bill’s Wild West Show, and it is not impossible that he would have requested a private showing. Whatever the truth, it is a good yarn which went down well with Escott North’s audiences. As with so much of Escott North’s life we know almost nothing of his First War service. There is no record of him serving in the British army, but he was in German East Africa serving as a scout. There he met the 25th Bn Royal Fusiliers with F.C. Selous and Lt. Col. Driscoll who no doubt welcomed him as a Frontiersman. In 1923 he sailed for Canada and, according to “The Frontiersman” magazine, was asked to carry out Frontiersmen business. No doubt he was asked to recruit, as the Frontiersmen had a strong representation before the First War, particularly in Western Canada where he was based. It does not seem that he had any real success at recruitment. During the four years he was there he made many friends, particularly Guy Weadick, the main originator of the Calgary Stampede, and gathered information for his very popular 1942 book “The Saga of the Cowboy”. In this book and in his many lectures he sought to correct inaccurate impressions of cowboy life and lore, which he mainly blamed on the film industry. In addition, his ability to play the piano earned him the friendship of cowboys, even in the wildest places. 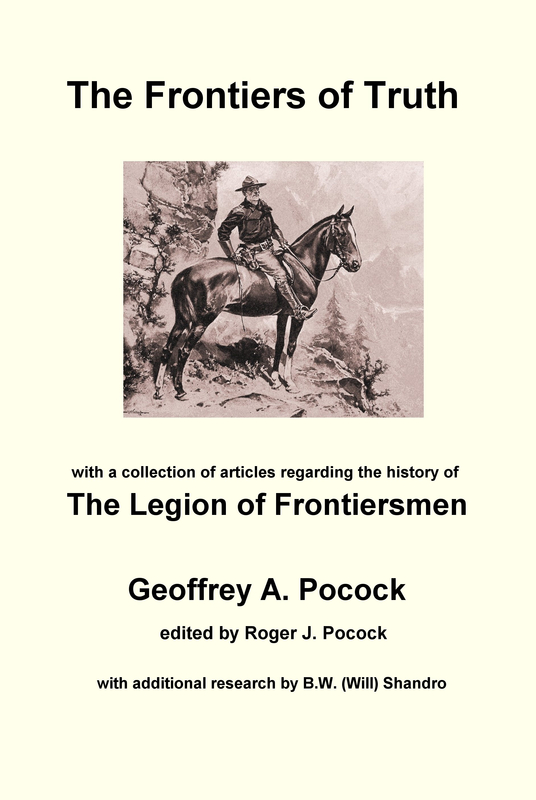 The Legion of Frontiersmen attracted as members many other men who had worked as cowboys and range-hands in both the United States and Canada. As well as using the Legion motto of “God Guard Thee”, these men also used “Vaya Con Dios”. Escott North kept his many notebooks of his travels over the years. You never know, perhaps one of his descendants still has those prize notebooks, which would be of substantial historical interest. Escott North was far from the only Frontiersman to have had such an adventurous travelling life. An Australian Frontiersman who also gave countless very popular lectures, in his case across America, was a Fellow of the Royal Geographical Society, as was Escott North. Following pre-war journeys of thousands of miles across Australia, this other extraordinary Frontiersman was awarded during his service in the First War not only the D.S.O. but – most rarely – the M.C. followed by two bars to it. As we have run out of space, his amazing story will have to wait for some later month. Then listen to the wild – it’s calling you. This entry was posted in Frontiersmen, History, Latest Topic, Legion of Frontiersmen and tagged Escott North. Bookmark the permalink. Hi Paul, yes if you would like to visit the sister website to this blog http://www.frontiersmenhistorian.info and go to the contacts page so you can get in touch by email, then we will be able to forward your enquiry.